So, that was a long blogging-break, no? Sorry about that. I spent the last semester teaching a new course at Cornell which sucked up all my energy. I won't be teaching next semester, so things should be easier, but I will likely be supervising some Master's projects, as well as a restoration of my barn and an addition to my house (timber-frame, strawbale as previously studied and here implemented by Tugleywood Timberframing). So I'm going to try to ease back into blogging on a weekly schedule for now (targeting Mondays). This reflects the fact that most of the growth in "oil" supply in the last decade was not actually oil but rather biofuels and natural gas liquids (which are substitutes for oil in some applications to varying degrees). After a spike up to around 10mbd last summer, Saudi production is down by about 0.5mbd. So that's probably most of the world's proven short-term spare capacity there. Not very much in a 91mbd global supply. I wonder if anyone has analyzed what the global warming and economic consequences would be if the Saudis by themselves, or the Saudis with Opec, raised production by a certain amount or lowered production by a certain amount or kept their production about where it is? Everyone has different views of exactly what happened from the early 70s to the first years of the 80s when oil production or gasoline prices were disrupted for various reasons. But I have the strong impression that the Saudis realized that disruptions in production interfered with their investments. Too many disruptions, regardless if they were involved or not, and their investments lost money. An analysis of different scenarios involving the transition from fossil fuels to alternative energy ought to be possible, and informative, but I haven't seen any. I wonder if anyone else has? 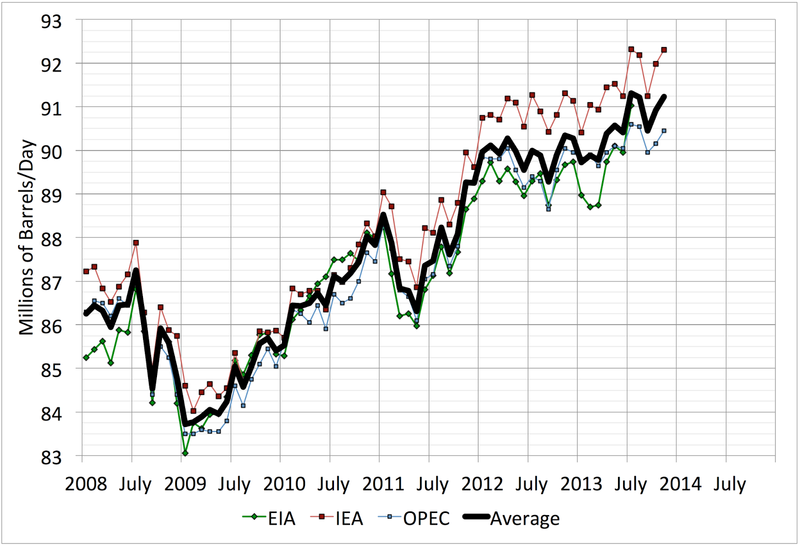 Welcome back, I guess you noticed that EIA has made an early release of the 2014 Energy Forecast. One may notice that US peak in tight oil is 2019. To Lars-Eric Bjerke: Thanks for the link. 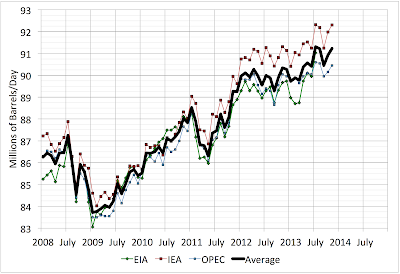 Lars - I saw the EIA report but haven't studied it. 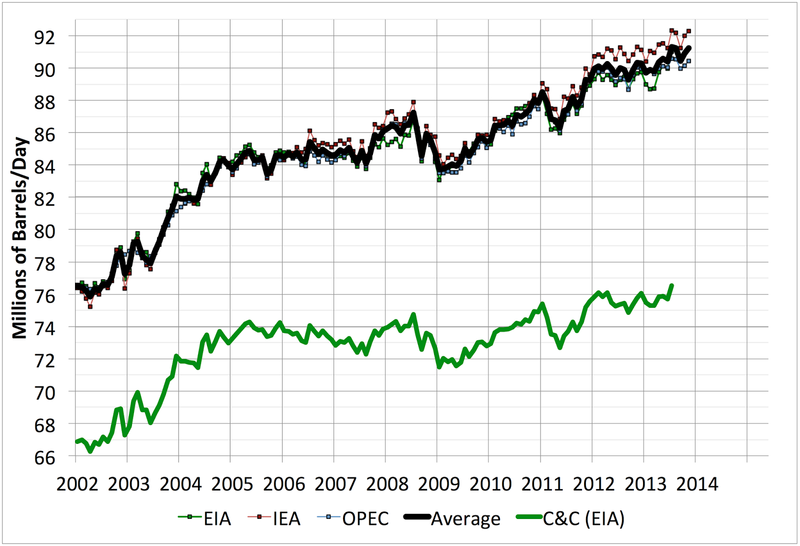 I haven't yet found any convincing way of assessing how big the tight oil might get. The URR is a product of a very big number (the resource in place) by a very small number (the recovery rate) and such calculations are inherently rather uncertain. I doubt it's $5/barrel any more given all the inflation in the factors of production in the oil industry. Still, we may posit that Middle eastern oil, especially in the stable countries, is much less expensive to produce than elsewhere. 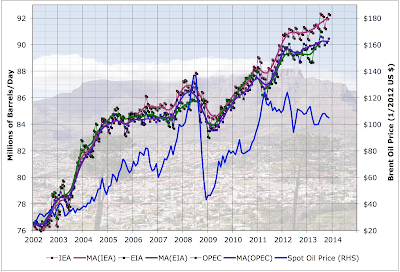 It doesn't really matter much though, since the price is set by the marginal barrel to produce. It's also the case that Saudi Arabia as a whole is now geared to high oil prices and cannot accept much less than $100 without running a deficit. During the Nobel week energy and fossile fuels were discussed during a whole day and can be seen on the web. The concluding panel discussion parrticipants were between Fatih Birol, Steven Chu, Karin Markides, Johan Rockström and Semida Silveira. 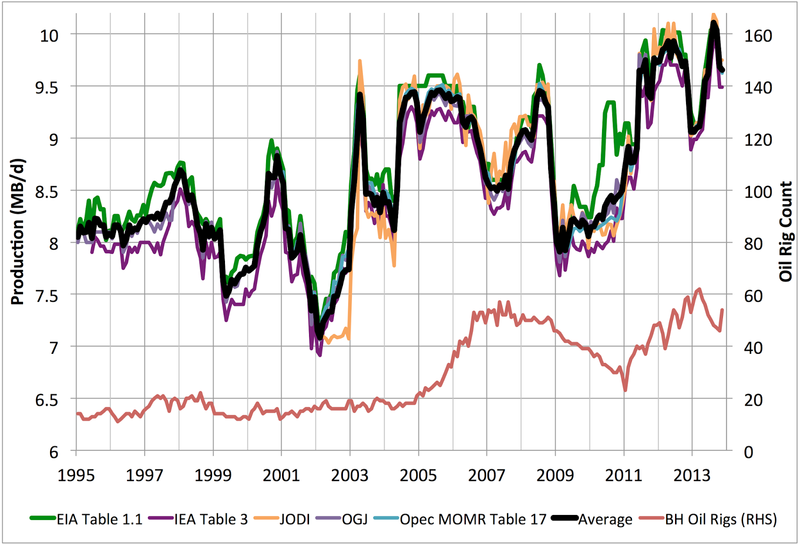 Has anyone tried to match up the trends shown in the blog post since 2009 against earlier peak oil predictions? I tried to do it in MS Paint and it didn't turn out too well. Lars: Thanks for the link to Nobel Week; some interesting stuff. Can we get another update please? can we get another oil supply update please?